You are currently browsing the tag archive for the ‘enoteca’ tag. Poor Giordano Bruno. Ten years before Galileo would take the same stance, this former Dominican friar had the temerity to assert that the sun and not the earth was the center of the universe, earning him a spot front and center in Rome’s Campo di’ Fiore, where he was burned at the stake. Four hundred years plus one decade later, I wait in the shadow of his imposing monument at day’s end, watching an army of street sweeping machines whoosh around the piazza seemingly willy-nilly to clean up after the day’s busy fruit and vegetable market. 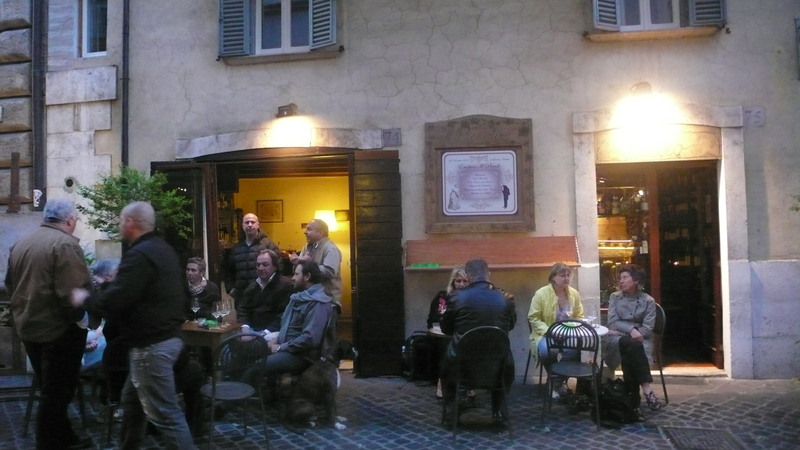 A fragrant cloud of squashed flowers, pulverized tomatoes and bruised basil fills my nostrils while tourists study the menu boards of cafes lining the piazza and locals lounge at outdoor tables smoking and drinking wine in juice glasses. The Saturday night before Palm Sunday in Rome, Holy Week upon us, and the city is more clogged than ever with tourists. Arriving late this afternoon, I’d navigated my way through the throngs in Piazza Navona, spying no less than half a dozen large tour groups, their guide waving high above his head the polka dot umbrella or the giant yellow daisy or the stick with a bright green ribbon tied to it. The clients, American and Japanese mostly, followed along like obedient puppies. I’ve always fantasized about how much more enjoyable Rome would be were its streets not jammed with these packs of knee-socked, camera-toting, menu turistico-seeking people from elsewhere. Where were the real Romans? Caught behind one of these gaggles of tourists, no doubt. And yet, though traditionally I have not been a proponent of guided tours, preferring rather to do my own research and make my own discoveries, on a previous trip to Rome, my companion and I were solicited on the endless queue outside the Vatican Museums and were persuaded to join a small group tour. If I’m honest, we were lured primarily by the promise of being able to sip coffee in a café while our guide waited on the two-hour line for us, but the real sweetness of the deal turned out to be the astonishingly knowledgeable guide himself, a friendly South African with a Ph.D. in art history, who spewed out nuggets of priceless and juicy information that resulted in a far richer experience than we could ever have had on our own. Given that successful foray then, with caution, I amended my position. A carefully chosen tour with a truly knowledgeable, personable guide can lend an extra dimension. It was this enlightened outlook that had provoked me to sign up this trip for a three-hour tour with the clever name, “Rome by the Glass,” which promised the opportunity to “indulge your inner Bacchus” as a certified sommelier brought you to local, authentic enoteche and educated you on the regional wines of Italy. Which brings me to be hanging out with the heretic Bruno under the afternoon’s waning sun. It’s not quite six p.m. when Ettore finds me and informs me I’m his only client tonight, and without further ado, we set off in the direction of our first enoteca. Ettore points out sights along the way—the Piazza Farnese, one of his favorite piazzas and one overlooked by tourists, the Holocaust memorial plaque and the Star of David on a red wall in the Jewish Ghetto, the captivating Fountain of the Turtles in the Piazza Mattei. He walks fast, talks faster and, for the moment, all I can manage is a nod, a smile. I feel shy, the only tourist on a group tour. Naturally our conversation at first centers around wine. Ettore’s knowledge turns out to be quite vast and I get the distinct impression that as much information as he’s feeding me, it constitutes only a fraction of all he knows. He tells me there are 450 varieties of grapes found throughout Italy. He explains about color and perfume and acidity and legs. Those are just the basics. Our first taste is a Sauvignon from the Veneto region. Ettore swirls the wine in the glass. Note the barely yellow color, like straw. Note how long the wine sticks to the side of the glass—not long, meaning low alcohol content. Note the smell—slightly grassy. This Sauvignon has been served fairly cold, allowing for more perfume while reducing acidity. It’s a young wine, he says. Less exposure to the sun, less heat, lend the wine its crispness. At last we drink. I hold the wine in my mouth a moment and close my eyes. I’m not good at this, I feel silly, but the Sauvignon playing on my tongue reminds me of a gentle summer night, a slight breeze riffling my hair, and I think, this tour is turning out all right. The second wine arrives and Ettore hasn’t finished emphasizing the importance of temperature, using Coca-Cola as an illustration of the relationship between temperature and acidity: the warmer the Coca-Cola, the more acidic. And since it takes three minutes to warm the wine by one degree Celsius, a good sommelier will serve the wine a degree or two colder than ideal knowing it will take a few minutes before the customer picks it up and drinks. Well now, that clears it all up. By now I’m thirsty and surely our Grecía Salentina has warmed sufficiently, so I pick up my glass. “This is a more direct wine,” says Ettore, hailing from Compania Avellino, a region on the bottom of Italy’s heel. He leads me through the steps: inspecting first the more golden color, then swirling again to show how the legs stick to the glass longer, evidence of the higher alcohol content. I swirl along with him and wait for the legs to drip back down. As we drink, the legs of our conversation grow stickier. The language of wine is so technical, I say to Ettore, commending him on his fluency in English, which prompts him to reveal his secret weapon: an American wife, originally from San Diego. He tells me the story of how they met a decade earlier, when he was selling sweet, peachy wine to undiscriminating tourists in Florence. After getting married, they started their tour company together. Then it’s my turn. Learning that my partner’s son is 23, he shakes his head. “In America,” he says, “he’s a man already, but in Italy he would barely be weaned.” Ettore himself is an exception, of course, but he laments the immaturity of his male compatriots, noting that even though it is changing, when Italian men marry, most still expect their wives to do all the cleaning, cooking, shopping, child-rearing and handling of household finances. Time for the next enoteca, and threading our way through the nighttime bustle of the city, we touch upon American politics, the depressed real estate prices in Puglia and his incomprehension about American fashion. What Ettore can’t understand is why American kids wear their jeans hanging down off their butts. In Italy, he points out, it’s the exact opposite—the tighter, the better. “I’ve noticed,” I say, and we laugh like two old friends. At La Vecchia Bottega del Vino in the Jewish Ghetto, Ettore orders us a plate of local charcuterie and another of cheeses. While we nibble on prosciutto and speck, bresaola and mortadella, we sample the first of two reds, a Nero d’Avola from Sicily. The heat of the sun comes into play here. In most places, the days are warm, the nights cool, but in Sicily the nights are also warm—influencing the taste of the grape. With the cheese plate comes the lustier Barbaresco, product of Piedmont. The Barbaresco has the longest legs yet. We swirl and sniff and sip while we shift now to the topic of children, and I’m surprised to learn that Italy has the second lowest birth rate (Spain is first) in the western world and that few Italian women have more than one child. Ettore chalks it up to economics, but I wonder. Whatever the reason, at this point, more Italians are dying every year than being born. Considering the Catholic majority in the country and the proximity of the Vatican, this is a revelation to me. Ettore and I are having a good time. We could linger over this table all night, but his wife is waiting on him for dinner and, after all, this is a paid tour, not a night out with a friend—although the distinction is hardly clear. 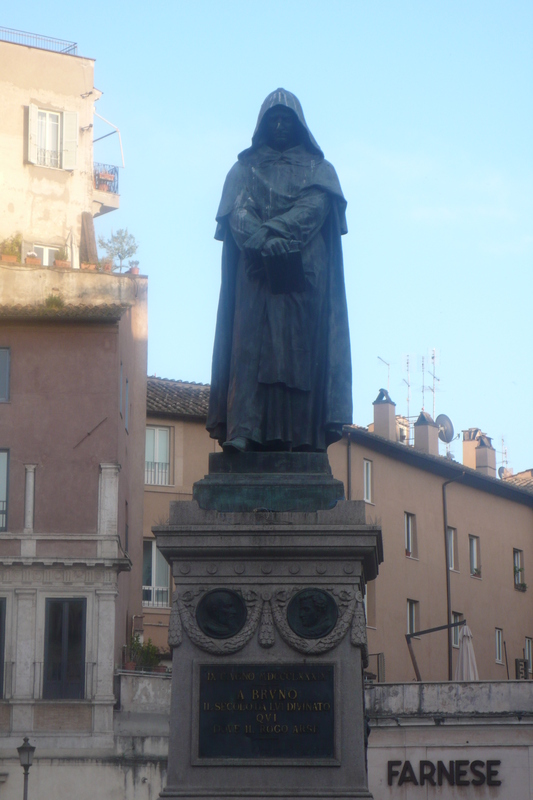 By the time we part company, it’s almost 10 p.m., four hours since I stared up at Giordano Bruno. Given his prominence, I imagine Bruno sees quite a lot of tour groups congregating at his feet. I reflect on the Inquisition which sentenced the former friar to death back in 1600, when apparently no one had a very open mind. I’m still skeptical about how many tours (and there are so many in Rome) give you a real feeling for the city, how many take you beyond the standard tourist pabulum, but after my enjoyable and educational night with Ettore, I’ll hold off on burning any tour guides at the stake.